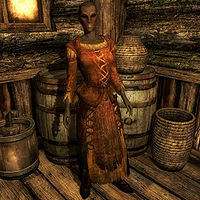 Niluva Hlaalu is a Dunmer citizen who works at Black-Briar Meadery but is struggling to pay her rent and is worried Indaryn will fire her for being a skooma addict. She starts her day early, waking at 4am. The next hour she will spend eating her breakfast before going to work at the meadery. At midday, she has luch for an hour before resuming work for another 5 hours. At 6pm, she quits working and goes to Haelga's Bunkhouse for 4 hours of relaxation before heading to bed there early at 10pm. Trying to speak to her will result in a series of defensive comments regarding how you cannot judge her for her addiction, "Hey, don't look at me that way! Who are you to judge me?" and "So what if I have a problem? I know how to deal with it!" If Maramal is still alive, he will also get badmouthed, "Maramal thinks he's so smart; tells me that Mara will cleanse the filth from my blood. Ha! What does he know?" From there on she will reflect on her past, "My n'wah of a father thought he could pull my strings... "continue the Hlaalu tradition." Bah! I left all that nonsense behind." As long as her boss is still alive, she will ask complete silence of you regarding her addiction, "If Indaryn finds out, he'll have me thrown out of the Meadery for certain. So don't breathe a word of it to him. Not a word!" She will then talk to herself about her financial struggles and the perfect solution, "Oh what am I going do? I can barely afford to stay at the Bunkhouse. ", "I'm going to stop. That's what I'm going to do! Then everyone will see that I'm not as useless as they think." During the quest Spread the Love, you may give her a pamphlet, though she won't be appreciative: "Mara only helps those who can afford her tithes. This is nonsense." This page was last modified on 8 July 2018, at 20:34.